Swimming has always been seen as an excellent way to exercise for all ages and the earlier one can learn the better. Mini Swimming was set up to allow the very youngest of children to become involved in fun, fulfilling swimming classes that also allowed parents to find friends as they went. Each Mini Swimming class is taken by a full qualified instructor who will be able to assist even the most nervous of parents who might be worried about taking their child swimming for the first time. Putting parents at ease is an important aspect of any Mini Swimming instructor’s job because the calmer a parent the happier and more relaxed the child which means that they can gain a lot more from their swimming classes in the long term. Swimming lessons from Mini Swimming offer not just the chance to learn how to swim, but for parents to spend uninterrupted bonding time with their children – something that isn’t always easy to find in day to day life. Plus swimming offers social development for children as they can interact with other babies and toddlers whilst making the most of their time in the water. 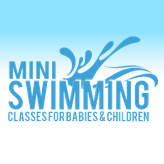 Mini Swimming offers parent and child classes and child only classes.